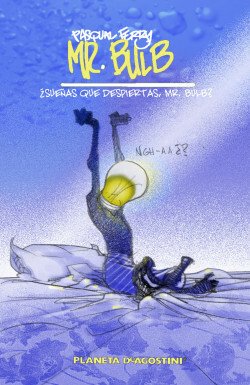 Mr Bulb is a character that embodies the idea in its quintessential form. It is surrounded by different feelings, such as sloth, greed, jealousy, etc. in the shapes of monsters and translucent beings. Every panel transmits a feeling from Mr. Bulb’s reaction to each human feeling that can be read and filtered through every reader’s personal experience. The book has 160 pages, each one contains a panel. Panels are framed within the page, so readers can even take notes around each panel with their own feelings and reactions to the illustration. The most personal piece of Pasqual Ferry .